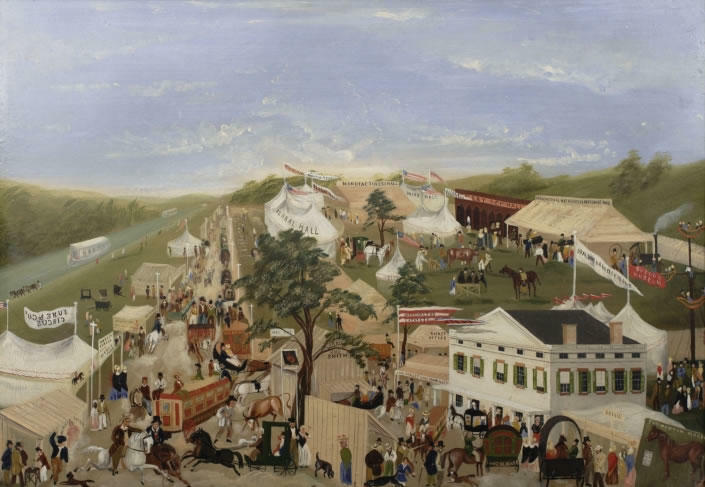 Held just north of Albany, the 1850 Tenth Annual Fair and Exhibition of the New York State Agricultural Society was the second hosted in the capital city. It opened for spectators on September 3rd and ran through September 6th. According to the Society's report*, "never was the attendance so great." This animated work captures the excitement of the fair and the throngs of people who attended the four-day event to see livestock, displays of fruits and vegetables, machinery, and farm equipment. The displays of flowers received special notice in the Society's report: "Floral Hall, in which every form of beauty was combined, under the direction of Dr. Herman Wendell, of Albany, was the object of unceasing admiration." Indeed, Floral Hall appears as the largest and most prominent tent in Wilson's painting. If you head over to the Friends of Albany History, there's a walk through some of the history of the history of this fair and the fairgrounds and how the modern Altamont Fair grew out of an animal fair on the parade grounds of what's now Washington Park in Albany. * John Wilson was also painted the 1848 watercolor "View of State Street, Albany" (also in the Albany Institute collection), which you might have seen before. See the banner that says "Spalding & Rogers Circus"? That's the circus company that bought the curiosity collection of the Albany Museum when it closed in 1855. Gilbert Spalding was a former pharmacist who lived in Albany and acquired the circus as payment for a bad debt. It turned out he had quite a flare for showmanship. He later formed the "Spalding & Rogers Floating Palace", a huge circus barge that plied the Mississippi River. The floating palace was in New Orleans at the start of the civil war. It was seized by the confederate government and converted into a hospital.